How to Transfer and Read MOBI Files on Samsung Galaxy S5/S4/S3? It is said that there is much more Samsung users than iPhone fans. Whether it is true indicates that Samsung brand becomes more and more popular in the world, especially, Samsung Galaxy. Samsung users love reading e-book, playing games and taking pictures with mobile all the time. Anyway, one of the reasons that Samsung is able to occupied market share so much is that many software are able to be installed in Samsung but iPhone cannot. Apple software is very special as the result that it becomes limitation for users to have it. But it is different with Samsung fans as they are really match with most of software. But the special one is that, the same as iPhone or iPad, Samsung are not allowed users to read MOBI e-books because MOBI format is not supported by mobile system. We have to confess that most of electronic device including camera, mobile, or some MP5 are unable to match with MOBI format. MOBI format must be converted into ePub before enjoy reading on Samsung Galaxy S5/S4/S3/S2/S. So, many retailers suggest Coolmuster ePub Converter (Windows 8/7/Vista/XP) or ePub Converter for Mac (Mac OS X 10.9 or later) directly to users when they are buying mobile in their shop because they knows that it is the best software for converting any format. For all users, it is really a necessary tool to keep with them at hand or better make it ready before buying mobile. The powerful function for this ePub converting software is not only focusing on converting MOBI to ePub; actually, it has some other function to present, such as converting almost all formats including MOBI, as well as Word, HTML, PDF and Text to high-quality ePub. Since ePub is the best file format for e-reading on Samsung phone. In order to make sure to read e-books on Samsung Galaxy, users can download Coolmuster ePub converter in advance. How to Open & Read MOBI on Samsung Galaxy Phone in ePub? 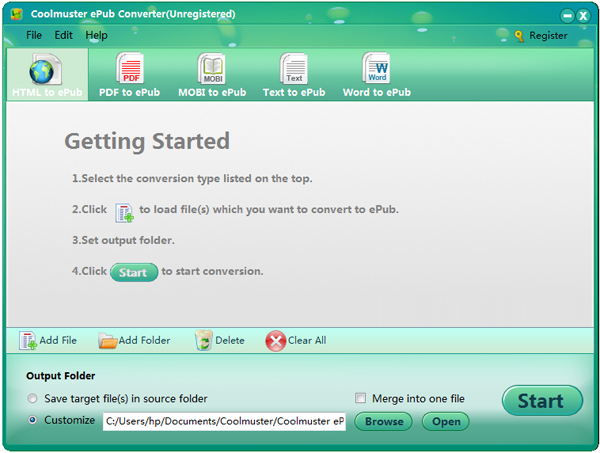 The conversion can be done easily by using Coolmuster ePub Converter. Several mouse clicks are enough for the whole task and the operations are the same on both Windows and Mac platforms. After installing the MOBI to ePub converter, double-click on the shortcut icon on the desktop to run it and then you will see the primary interface of the program like the below pictures shows. There are several conversion types are available that you just need to choose "MOBI to ePub" for this topic. Click "Add File" or "Add Folder" or use the drag-n-drop operation to import the target MOBI files. All the imported MOBI files will be displayed and listed on the interface and ready to turn into ePub format. You can click on the "Customize" button to choose an output folder for the converted files. Click the "Start" button to kick off the conversion process. The conversion can be finished soon and the output ePub files will be exported to the specified folder directly. Now, you can connect your Samsung phone to the computer via a USB cable, open the output folder and transfer these ePub files or eBooks to your Samsung Galaxy S5/S4/S3/S2/S directly. 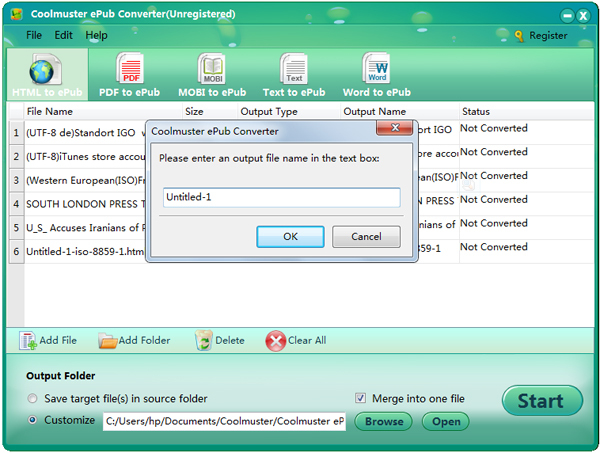 Free download Coolmuster ePub Converter to have a try!